It's 20 feet long !!! 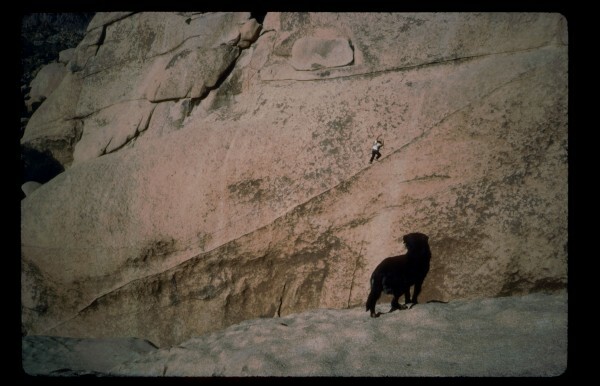 Jeff, that's not me on belay. Never wore a headband like that and way too much hair! FISH was there.. looking for verification. Might have been '82. Or earlier. Driver's bouldering fall at Stoney Point. That was actually the 1st time I'd met him. Late '78 or early '79. I was not with you guys at the ER. Wasn't one of the nurses Yaniro's Mom? You talking about the day the Driver smacked his elbow and we met Yaniro's mom at the clinic afterward, Jeff? Of course you are. Quite the coincidence that Jack and I met the Yaniro mom as a consequence of Greg's crash. I don't remember much about his actual fall. Happens fast, you know. I caught his thumping out of the corner of my eye. Tony's mother was pretty cute! A talker, too. Jack drove us there in his yellow Datsun B 210. Who else was hangin'? I can't quite remember. Maybe just you sending us off to the clinic. There was only room for three. (Fisticuffs) FA by John Long and Rick Accamazzo in 1973. Yo Bros! Thanks for the comments on Washoe. He was The King for a long time. No other dog could touch him. Leave it to Fish to work out what sounds translate into vibrations snakes can understand. Cleary he's a genius!